I love this time of year in Jerusalem, Israel. When the ground turns green with new growth, though the days are noticeably shorter and nights so much longer and colder. 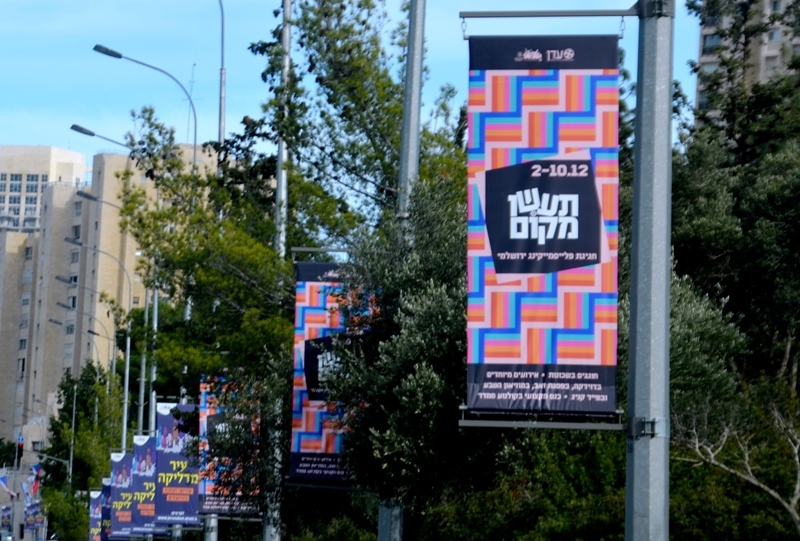 New signs pop up and line Jerusalem streets, as these for events in the Old City, City of Lights. 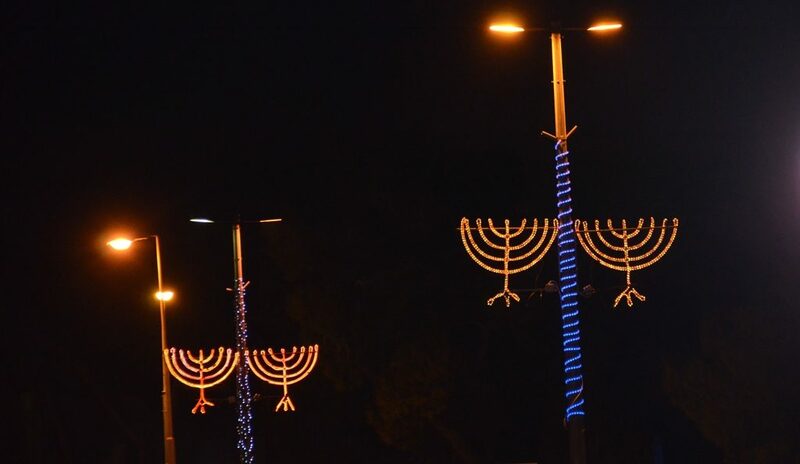 For eight days, from December 2-10, Jerusalem is the place to be to celebrate Hanukkah. This year joining those those familiar street decorations, the Ministry of Diaspora Affairs sponsored something new. 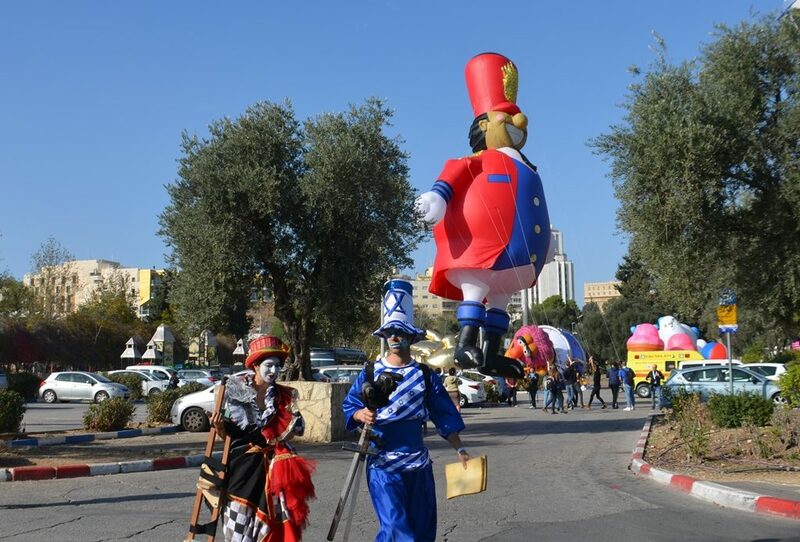 Big balloons, big bands, thousands of people marching through the Jerusalem streets, just like down 5th Avenue every Thanksgiving in NYC? 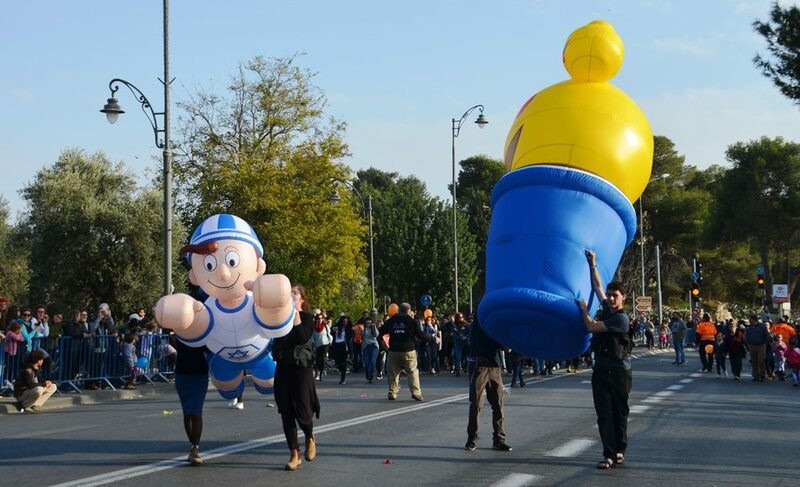 I went early to check out the first ever Jerusalem Hanukkah ‘Together Parade with the Jewish Diaspora’ in the Liberty Bell Park where the parade was to start. So happy I came in through the parking lot side, as there the balloons were getting pumped up and ready to fly through the sky. The parking lot was not accessible for vehicles, but perfect for sitting in the pleasant sunshine to enjoy the pre-show prep. 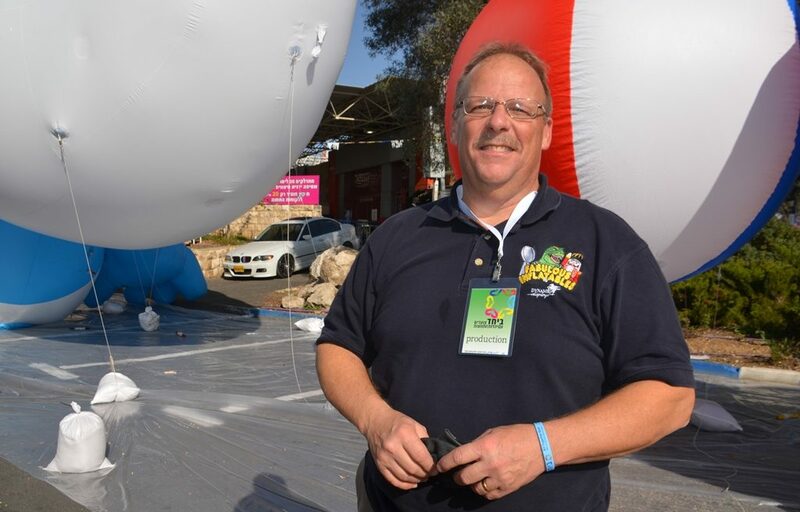 Dave came from the US, to oversee the technical aspects of his big balloons. Dave and Matt had arrived from their last parade held on Broad Street, in Richmond, VA. 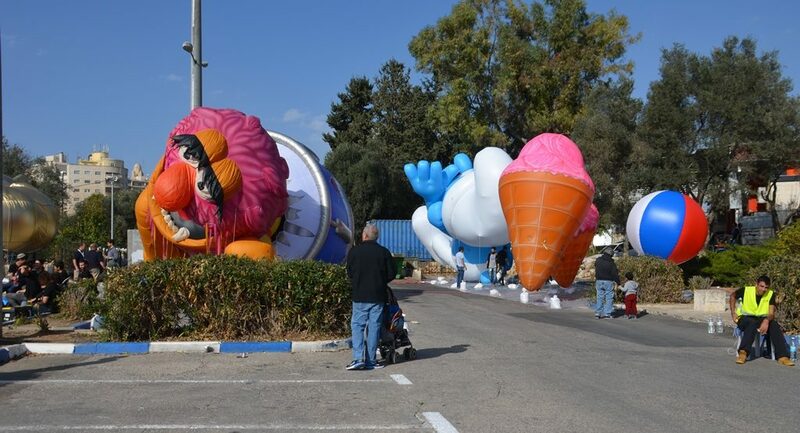 These were not the balloons from the Macy’s Parade, but the big ones were indeed big. 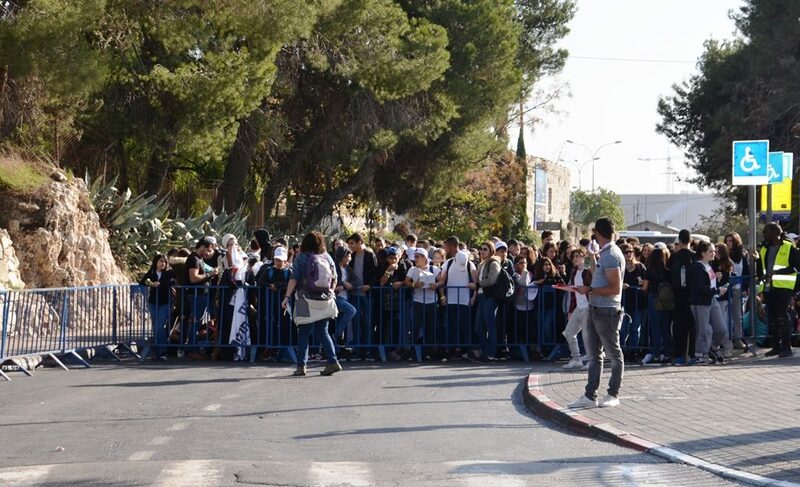 Thousands of students came from around Israel to march in the parade, and were waiting at the start line near First Station. The problem was that the other people at First Station who were not marching could not get close enough to be spectators. 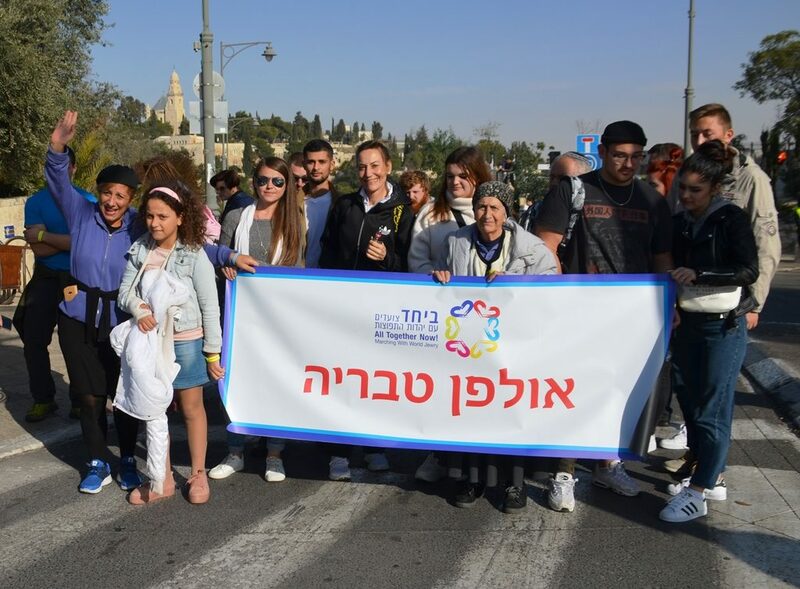 This parade was for togetherness, Israel and Diaspora, so what better than to have new immigrants who were learning Hebrew in Ulpan participate. 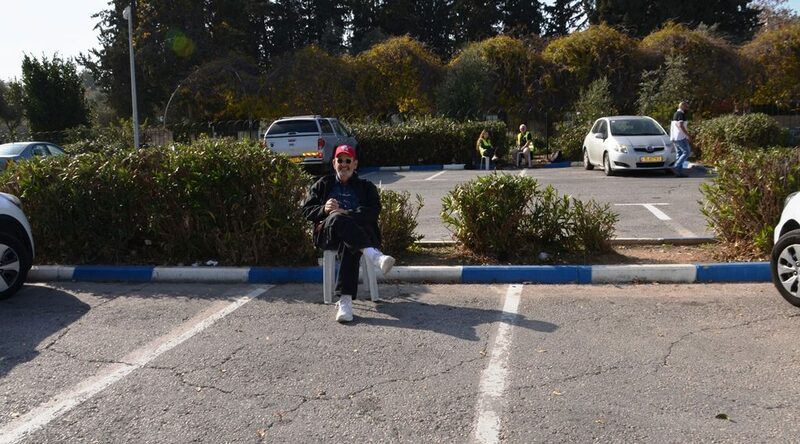 Teveria Ulpan was ready to go and honored to be the first group. 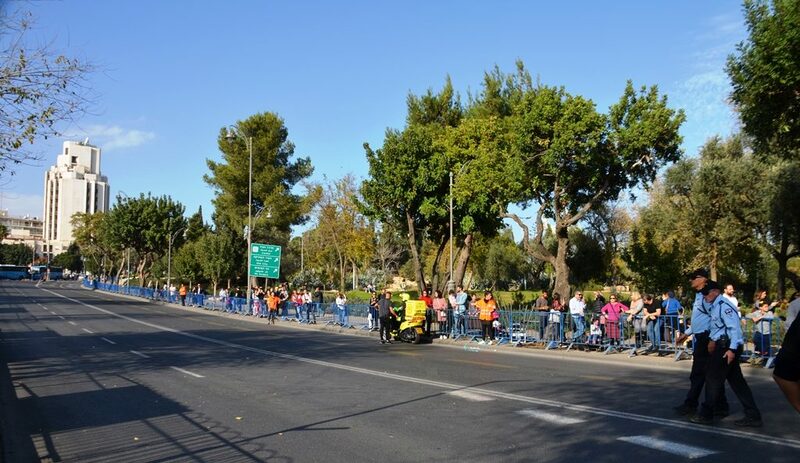 Major roads were closed off to vehicles and pedestrians. 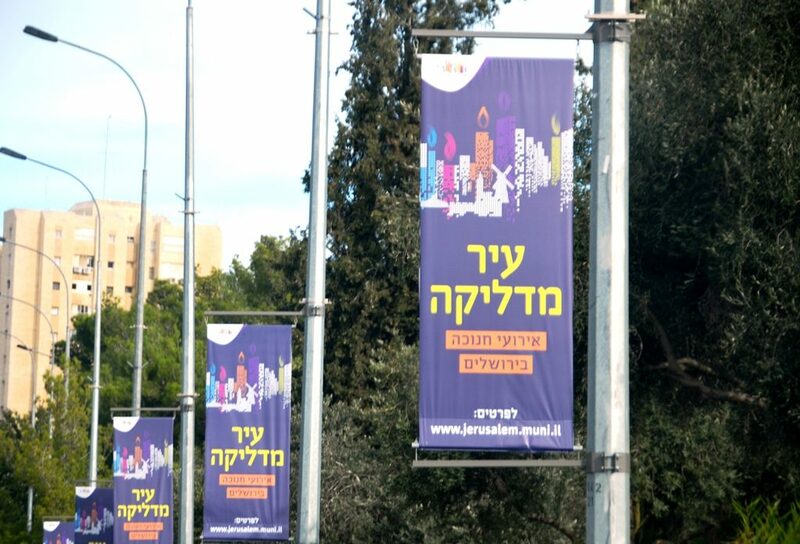 Not a good way to make Jerusalem residents feel love for anyone or anything. Lined up and ready to roll along the Liberty Bell Park, at the 2:00 pm announced starting time. 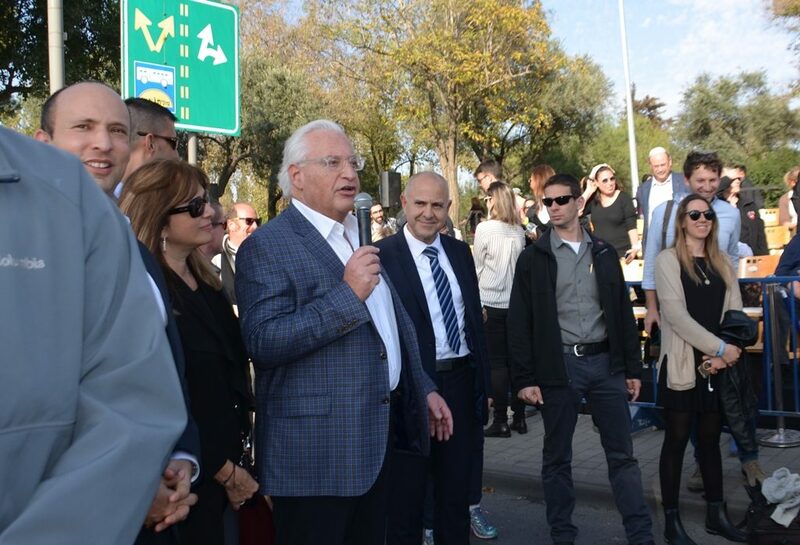 US Ambassador David Friedman and Naftali Bennett spoke briefly. I think Naftali Bennett had the best time, except maybe this young man in the video from Chile and his friends. A loud popping noise, and blue and white streamers filled the sky. Bennett and the Friedmans led the way along King David Street as Grand Marshalls. A video is needed here to share the scene, not exactly 5th Avenue precision. 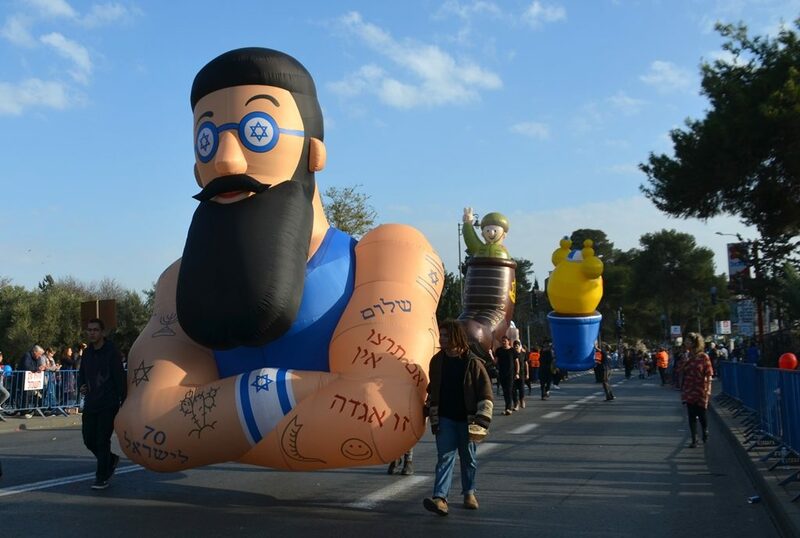 This together parade was more Israeli style than Macy’s. 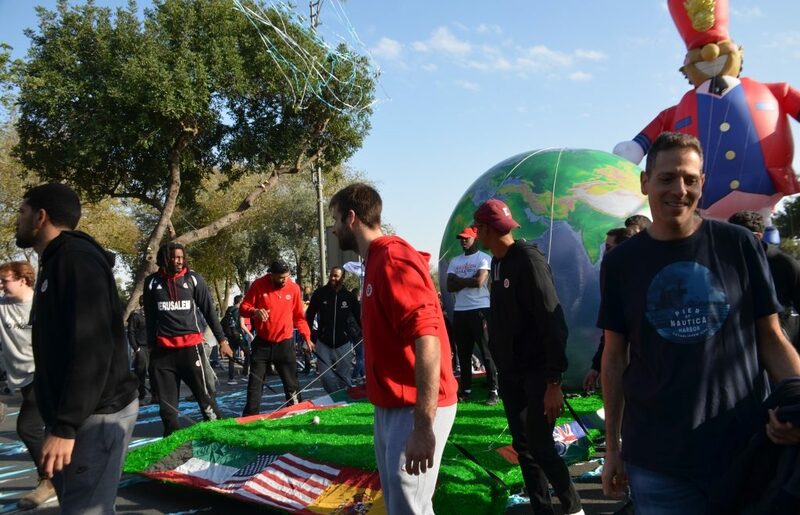 But there was music and a float with Jerusalem basketball stars, including Amar’e Carsares Stoudemire. 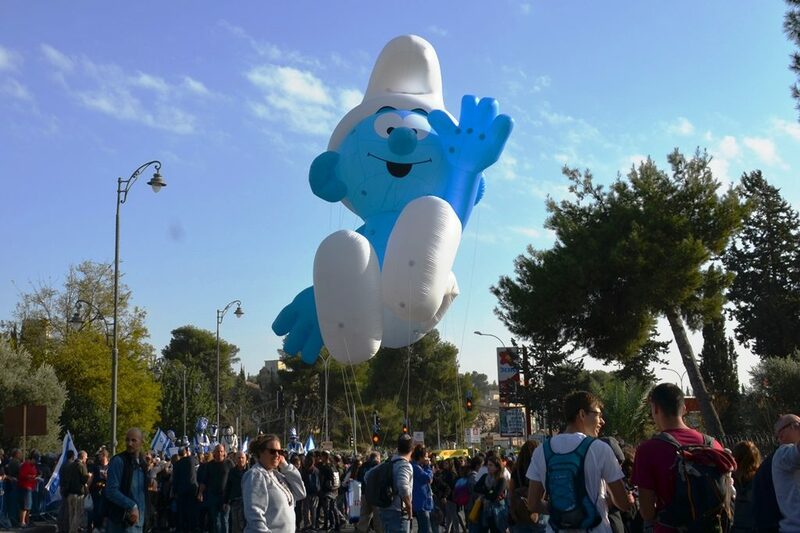 I kept saying Snoopy by mistake, but I did like this giant smiling smurf. 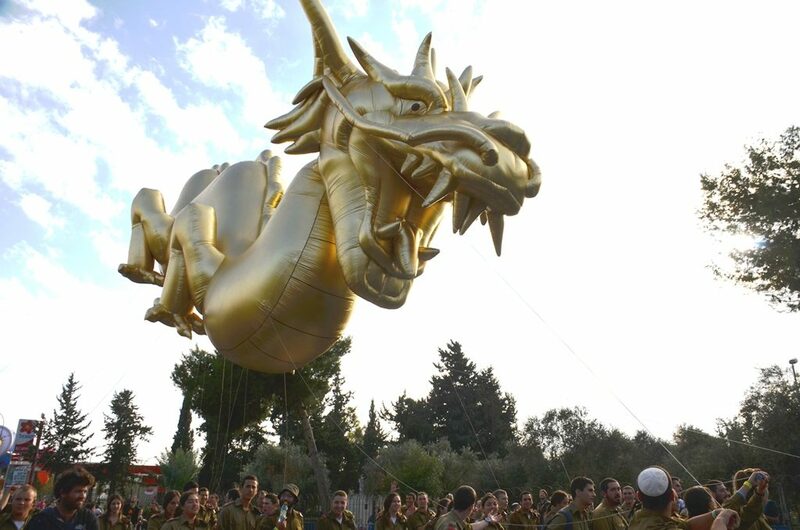 The Golden Dragon was protected and held down by dozens of IDF soldiers. 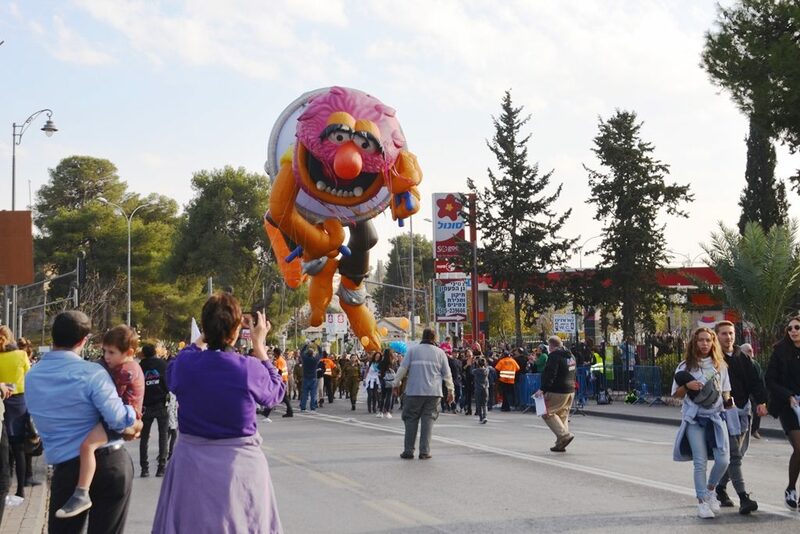 The Muppets Animal was another big balloon held by uniformed soldiers. No Sesame Street characters did I see in this parade. Near the end of the parade was a train engine pulled by a truck with musical performers on top. 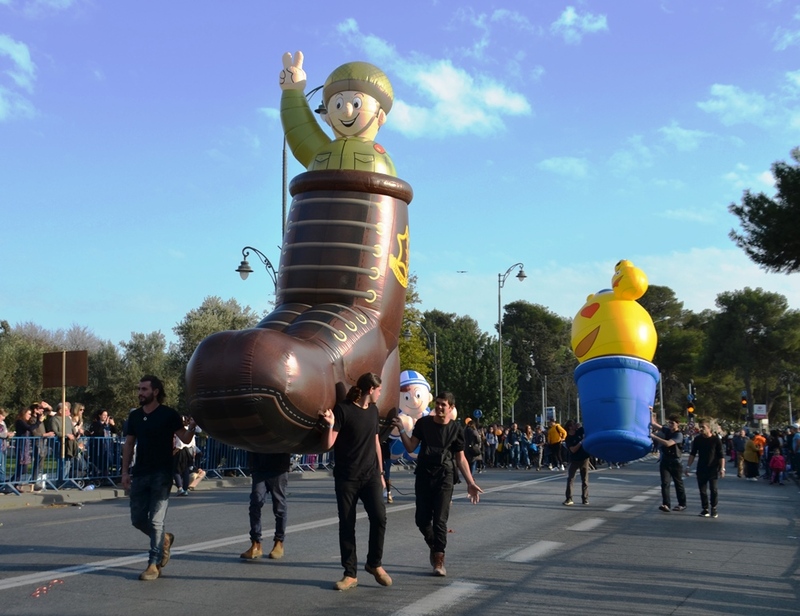 and an IDF soldier in a paratrooper boot making a peace sign. For a first ever attempt, it was fun bit of time spent on Hanukkah. 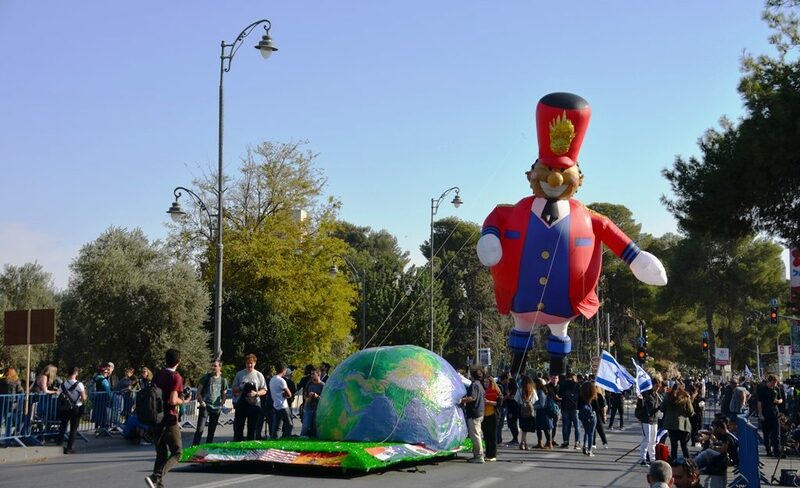 The weather in Jerusalem, Israel, was way better for a parade than New York City! 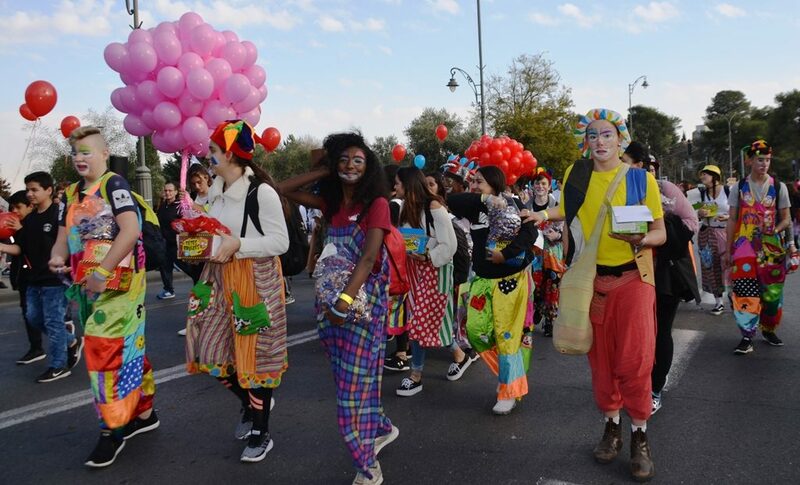 However, the parade was held when most children were in school and couldn’t come to watch. Here is a short piece near the end of the marchers, oops, the music stopped. Rather than being for the spectators, this event was more for those participating. participants were treated to a free performance by Matisyahu. At least I was able to hand over some candy I received from those clowns to a family arriving after it was all over to sweeten their visit to Jerusalem. We will have to wait and see if this is to become an annual event. 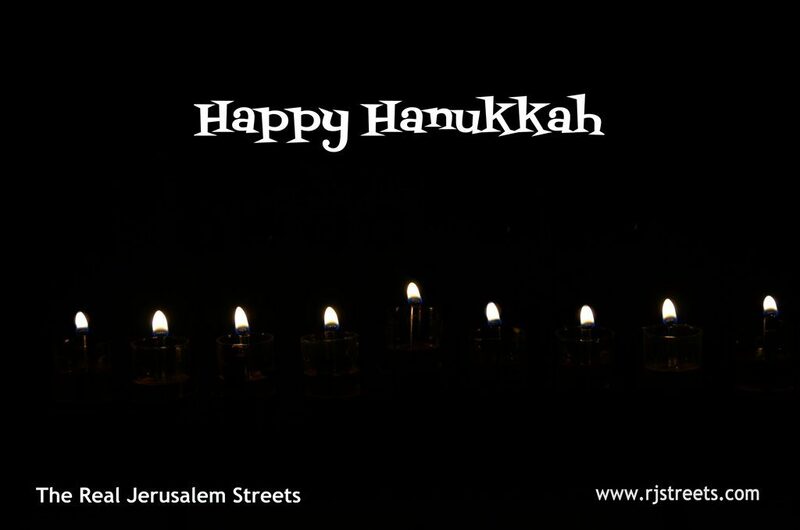 There are so very many things happening on the Jerusalem streets on Hanukkah, will share favorites next time.